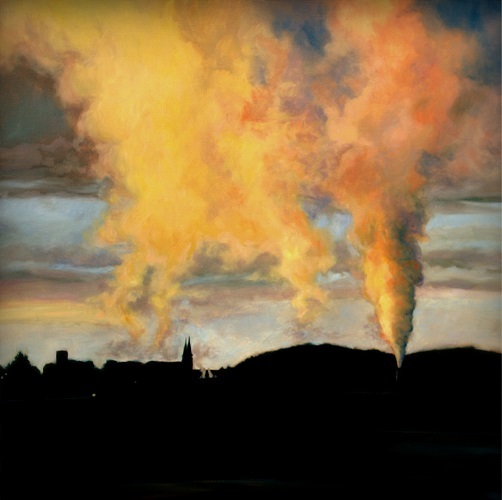 The University of Maine at Presque Isle’s Reed Art Gallery will present Painted Landscapes of Aroostook County by Michelle Mishaan from April 1 through May 10, 2019. The public is invited to view the exhibition throughout the show’s run and attend the Gallery Reception on Friday, April 5, from 5-7 p.m. with an artist talk at 5:30 p.m. Light refreshments will be served. This reception is being held in conjunction with the First Friday Art Walk. The Reed Gallery is located on the second floor of the University’s Center for Innovative Learning. Mishaan is an adjunct art professor for UMPI and current resident of Madison, Maine. She is moving to Caribou and has been exploring the County landscape during her many commutes. Her painted landscapes series is an exploration of the various natural seasons and variety of landscape features from Madawaska to Houlton. Her show will feature 30 oil paintings based on photographs she has collected during the past 15 years documenting her travels. Mishaan said her paintings explore color and texture by capturing the changing light of the seasons, and reflect her journey woven together with memories over time. “These paintings are from my own personal experience and connection to my surroundings—my feelings, my emotions, my response to the effects of light changing before me in an isolated vehicle; the vast landscape that lay ahead and beside me, inspiring me to create a body of work,” Mishaan said in her artist’s statement for the show. Mishaan earned her Bachelor of Fine Arts degree from Cornish College of the Arts in Seattle, WA, and her Master of Fine Arts degree from Vermont College of Fine Art in Montpelier, VT. She also undertook postgraduate studies in Teacher Education from Lewis Clark State College in Lewiston, ID. She has participated in several group shows, juried shows, and solo exhibits throughout Maine, Vermont, New York, and Ohio, as well as in Sweden and Germany. She also has served as a featured artist in Glamour Magazine UK edition, and the Bangor Daily News’ Artist of the Week Series for Schools. All are invited to view this show between April and May and to come out to the First Friday Art Walk on April 5 and take part in the free reception at 5:30 p.m. Light refreshments will be served. In addition, this show will be open during the First Friday Art Walk on May 3 from 5-7 p.m. Please follow gallery happenings on the Reed Gallery Facebook page, www.facebook.com/ReedArtGallery. The Reed Art Gallery is located on the second floor of UMPI’s Center for Innovative Learning and is open Monday through Thursday from 7:30 a.m. to 10 p.m., Friday from 7:30 a.m. to 4:30 p.m., and Sunday from 2-10 p.m. The gallery is closed on Saturdays and University holidays. For more information about this exhibition, please contact Reed Gallery Director Hyrum Benson at (207) 768-9441 or hyrum.benson@maine.edu.